I have put all the css and js for jquery date picker. It works partially. 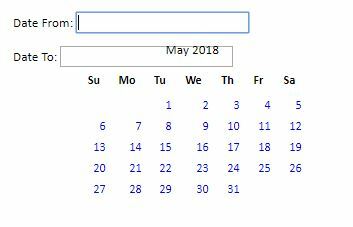 It can show the calendar but i think the css is not working. secondly, how do i disable all the date which is before the 'date from' so that when i select my 'date to', it will be more make sense? The following sample for your reference. Maybe this is the effect you want to achieve. Thanks. It works if I don't connect to the default MVC template layout. But, just wondering why if I use the default MVC template layout, it is not working. please refer the custom style above(my first reply) in MVC template layout. Besides, you can visit the JQuery Support Center for getting further help.